Hidden terminal problem is due to the fact that a node (say A) transmitting to another node (say B) cannot hear transmissions from another node C, which might also be transmitting to B, and might interfere with the A-to-B transmissions. Exposed node problem occurs when a node is prevented from sending packets to other nodes because of a neighboring transmitter. Mobile IP (or MIP) is an Internet Engineering Task Force (IETF) standard communications protocol that is designed to allow mobile device users to move from one network to another while maintaining a permanent IP address. The encapsulation process creates a logical construct called a tunnel between the device that encapsulates and the one that decapsulates. 7. How the mobile nodes identify the current location? Explain. The mobile nodes identify the current location with the COA. A care-of address (usually referred to as CoA) is a temporary IP address for a mobile device. This allows a home agent to forward messages to the mobile device. A separate address is required because the IP address of the device that is used as host identification is topologically incorrect - it does not match the network of attachment. The care-of address splits the dual nature of an IP address, that is, its use is to identify the host and the location within the global IP network. GSM (Global System for Mobile communication) is a digital mobile telephony system that is widely used in Europe and other parts of the world. GSM uses a variation of time division multiple access (TDMA) and is the most widely used of the three digital wireless telephony technologies (TDMA, GSM, and CDMA). Error Control- The end to end transfer of data from a transmitting application to a receiving application involves many steps, each subject to error. Flow Control- Sender sends data at higher rate and receive is too sluggish to support that data rate. Signaling System 7 (SS7) is architecture for performing out-of-band signaling in support of the call-establishment, billing, routing, and information-exchange functions of the public switched telephone network (PSTN). • Tree-based protocol-Establish a single path between any two node. These schemes require minimum number of copies per packet to be sent along the branches. Hence they are bandwidth efficient. • Mesh-based protocol- Establish a mesh of path that connects the source and destination. The type of network used in moving automobile is VANET. VANET- The Vehicular Ad-Hoc Network, or VANET, is a technology that uses moves cars as nodes in a network to create a mobile network.VANET turns every participating car into a wireless router or node, allowing cars approximately 100 to 300 metres of each other to connect and, in turn, create a network with a wide range. • Monolithic Kernel-the kernel essentially constitutes the entire operating system code,except for the code for the shell. • Microkernel-This approach tries to minimize the size of the kernel code. An integrated development environment (IDE) is a programming environment that has been packaged as an application program, typically consisting of a code editor, a compiler, a debugger, and a graphical user interface (GUI) builder. The IDE may be a standalone application or may be included as part of one or more existing and compatible applications. 19. State the important features of SDK. • Server program-runs on the background process. 20. 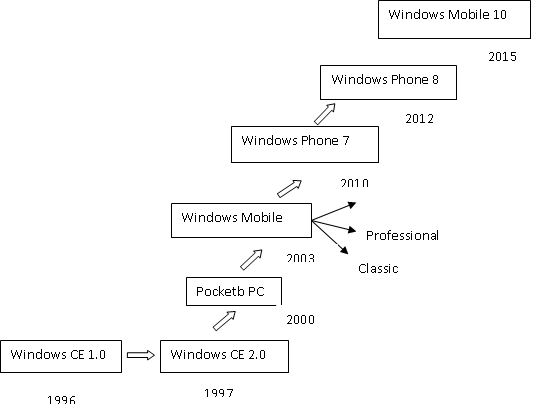 Draw the Evolution of Microsoft’s mobile OS.